We have some frogs at our house in Briarcliff Manor. Our friends are staying there at present and have (or at least one of them has) developed a strange attraction to them. Yesterday he sent me a message with an attached picture saying that a “large” bird had turned up and that the frogs had disappeared. He suspected that it had been eating them. It didn’t want to leave, but did eventually after he threw stones at it. The picture was a bit blurred and the bird was somewhat distant and consequently small in the frame. 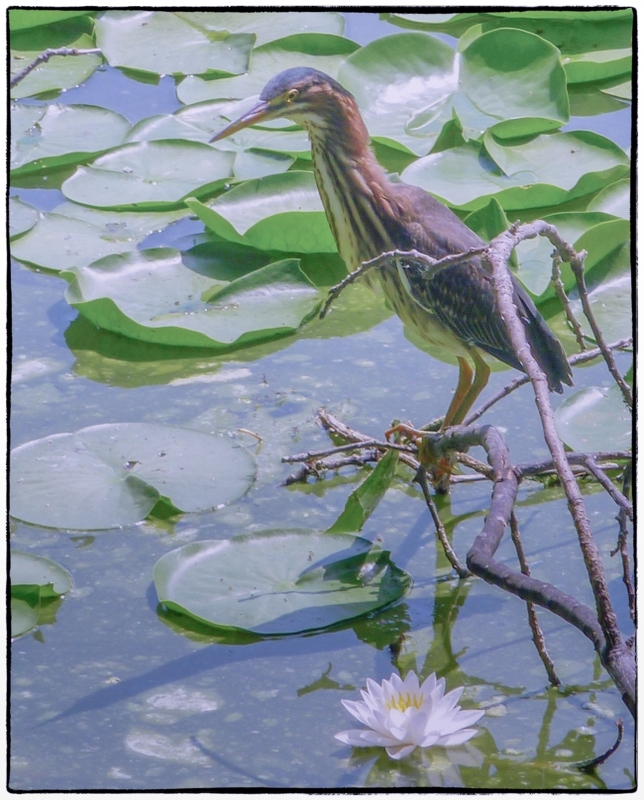 However, it looked to me as if it was a Green Heron. I’d taken a picture (see above) of this bird at Teatown Preservation so I sent it to him and he confirmed that it was the bird in question. I don’t know about it being “large” though. Green Heron’s are only about 17 inches tall. Bigger than, for example, a sparrow I suppose, but much much smaller than the Great Grey Heron’s we have at the lake (but which I unfortunately have been unable to get a picture of so far). They’re magnificent birds, over three feet tall. I once saw one chase off a number of much smaller Egrets from its piece of the lake. Oh, and yes Green Herons do eat frogs!